The Free Music Archive has now been up for a little over a year and in that short time we've come a long way. We have lots of big plans for our roadmap including implementing a recomendation engine, enhancing our api, overhauling search, oAuth integration and lots, lots more. • any visual design + flash chops are a plus! If you have any experience developing music sites and working with things like the Echo Nest API and XSPF playlists those are really big pluses. If you are interested please drop a line to jason -at- freemusicarchive dot org and let us know about any projects you've been working on along with relevant urls. If there are any music sites or apps that you like to use on a regular basis please be sure to let us know about those too. It's been almost five years since Warren Ellis, Jim White and Mick Turner have recorded a studio album as the Dirty Three but it looks like they've been keeping busy. Drummer Jim White, who now lives is New York, has been anchoring Cat Power's Dirty Delta Band while sitting in on various gigs around town while violinist Warren Ellis, a member of Nick Cave's Bad Seeds, has spent the past few years scoring several films with Cave including this fall's upcoming screen version of Cormac McCarthy's "The Road". "Ocean Songs" is probably my favorite album by the Dirty Three and All Tomorrow's Parties organizer Barry Hogan most likely feels the same way as the 2009 New York installation of the festival marked the third time that the band has played the album in its entirety as part of ATP's Don't Look Back segment. The album is decidedly less raucous then some of the band's earlier work and the slow, almost dirge like compositions are loosely structured allowing everyone lots of opportunity to stretch out and improvise in a live setting. The album reaches its climax with the epic 16 minute track "Deep Waters" which finds the band exploring a wide dynamic range from quiet finger picking to a rather loud, crashing tumult. Like many of the tunes on the album "Deep Waters" is a bit of a mood piece and the song has a staggering, almost drunken quality that always threatens to fall apart before returning to beautiful, repetitive violin pattern played by Ellis. 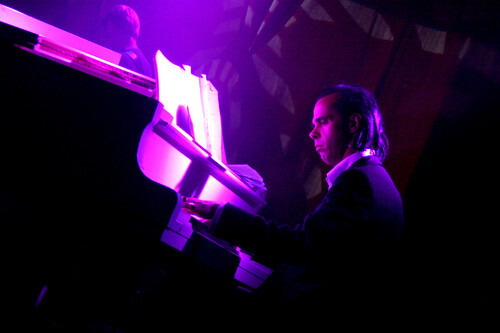 Joining the band to play the piano parts originally played on the studio album by David Grubbs was Nick Cave, resplendent in a sharp black suit. The tune was one of the grander moments I witnessed in the Starlight Ballroom over the course of the weekend and definitely one the festival's stand out performances. The Necks - "Night One/Set Two"
Hass is king of the avocados!